The Bok Choy or Chinese cabbage are in the ground. Multi colored carrots, broccoli, and spring onions are looking up after 3 1/2 weeks! So what are the downs? 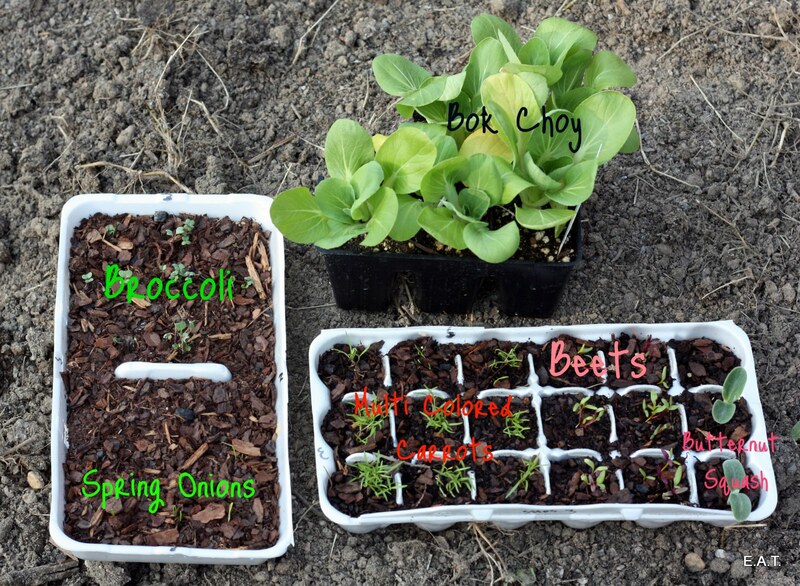 Swiss chard, peas, spinach, and arugula (personal favorite) have never sprouted with ample time to do so. Sunday was spent re-seeding those essentials for the spring garden here at E.A.T. The one thing we wanted was arugula this spring and with a little delay we will get there! Are you expecting one more frost this spring? It is a learning experience every year. I think it's a little warmer where you are, than where I am. But, I fear we will have a few more frosts. I feel confident about the carrots, garlic and onions, but I am still waiting on the lettuce. We are growing rainbow swiss chard for the first time and I can't wait to put it out! Very nice on the swiss chard as we are also doing rainbow swiss chard and carrots.